We all know and have employed myriad physical remedies to heal a sore throat/strained vocal cords. We’ve steamed and tea-ed and silenced our way back to health (or at least enough to squawk our way through a gig). But how often have you considered the impact of internal and spiritual balance when it comes to your vocal health and prowess? CHAKRAS are energy centers within the human body which regulate and stabilize its operations. They include organ processes, immunity, and our emotions. 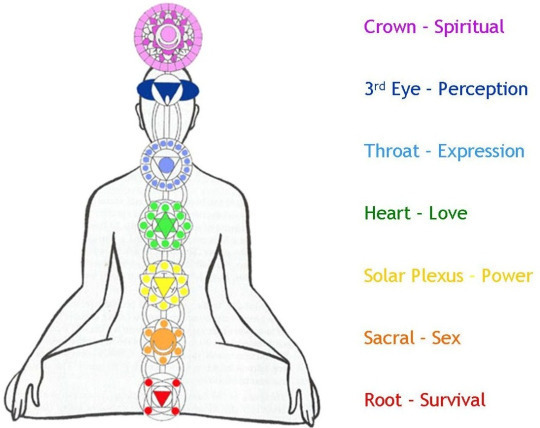 There are seven major chakras positioned from the base of the spine to the crown of the head, each representing foundations of our human experience and functionality. A balanced Throat Chakra will cultivate clear communication and creative expression within ourselves and to be received from others. Opening this delicate chakra will summon our inner truth and help that truth to be represented vocally. Signs of a weakened throat chakra include: shyness in speech, stuttering, nervous clearing of the throat, a sensation of choking back emotions, whispered speech, or perhaps eliminating vocality altogether. Signs of an hyperactive throat chakra include: chronic sore throat, laryngitis, rapid speech, self-deprecating speech, inability to listen, condescension/judgement and dominating conversation. A mudra is a spiritual gesture that helps to summon specified energy. 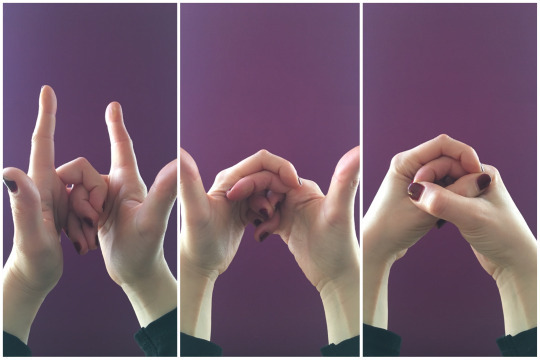 Interlace your last three fingers (middle, ring and pinky) together inside of your hands. Interlock the index fingertips and thumbs to form two rings and hold this mudra in front of the base of your throat. Inhale and exhale through the nose for 4 rounds of breath. Inhale deeply though the nose. Open the mouth and exhale like you are fogging up glass. Repeat 4 times. The sensation of Ujjāyī breath will be similar to that of the glass fogging exercise, however the mouth remains closed. Focus on the throat. Inhale and exhale deeply through the nose, while lightly constricting the back of the throat. The breath will have an oceanic effect, like that of waves crashing. It may feel similar to the sound of deep sleep breath. Find your “natural pitch”. That is a note in your range that feels comfortable and able to be held without strain. Inhale through the nose and chant the sound “HAM” (Haaaaaaahmmmmm) with your chosen pitch for the full length of your exhale. Repeat 8 times. Return to Ujjāyī Breath for a round of 4. Repeat chant 8 times. The color associated with the Vishuddha (Throat) Chakra is a sky blue. Vishuddha translates to “especially pure”. Envision a pure, crystal-blue light, streaming in like a spotlight to the center of your throat. As you inhale and exhale, see it fill the space and cleanse the entirety of your neck and throat. 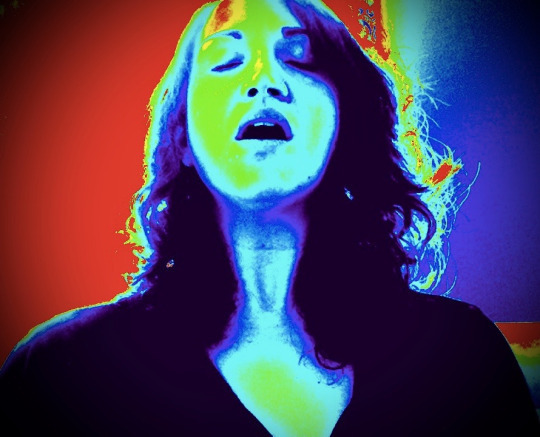 Expand the light to go deeper and purify the larynx, the vocal folds, the thyroid. Deepen the breath and resume your Ujjāyī Pranayama or chanting the sound “HAM” silently. Envision any toxins, impurities, and contradictions as black vapor separating from the blue light. Inhale deeply. Open the mouth, stick out the tongue, and exhale strongly on a fiery ‘HA” sounds letting all the breath drain out. Expunge the impurities as you repeat 3 times. Return to a natural set of inhales and exhales for 4 rounds. Repeat out loud twice and another two times silently. Applying these exercises/incorporating them into your existing vocal warm up, will encourage equilibrium both internally and externally. Liberate yourself and let your true voice thrive!